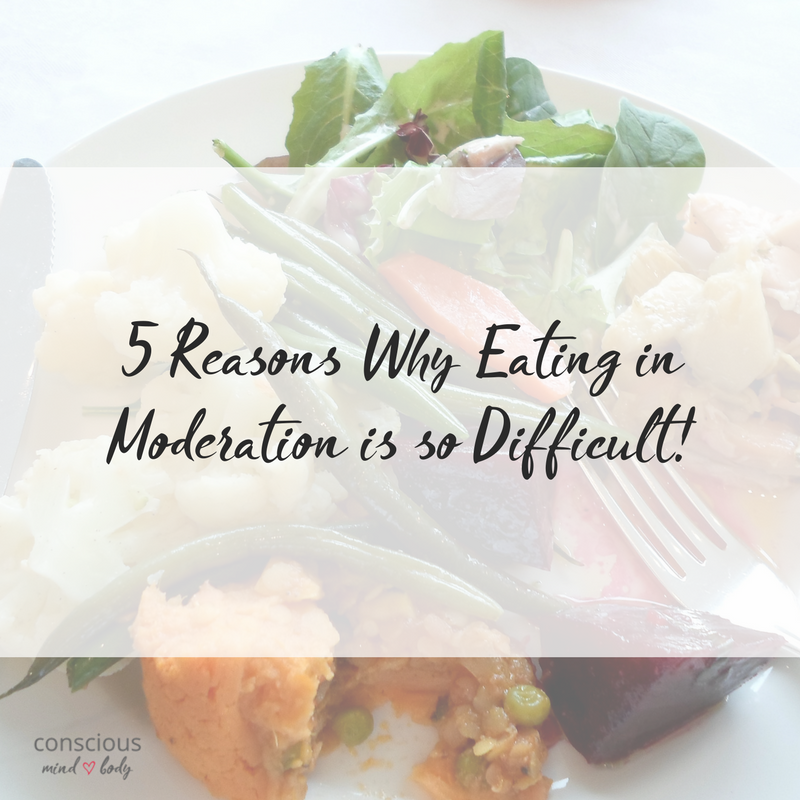 You’ve probably heard that if you “just” eat in moderation you can eat anything! For someone who doesn’t emotionally eat it’s an easy thing to say. But, if you’re trapped in the cycle of emotional eating, dieting and back again it’s another story. Eating in moderation is a great foundation for getting a wide variety of foods in your diet. Feeling good about what you eat, getting enough energy and just plain freedom from the preoccupation with nutrition/food and body image. Here are five reasons that are holding you back from moderate eating and what you can do about it. 1. Focusing too much on the details. When you spend time focusing on the details of food rules you can lose sight of the big picture. The external rules seem to take on more importance than your experience of nurturing yourself. Focusing on the details too much leads to silencing your ability to listen to the feedback your mind and body are giving you about what you need. For a lot of people, this leads to overeating as a reaction to over focusing on the rules. Focus on covering the basics nutritionally while you loosen up the food rules. Slowly changing over time is usually more sustainable than one big overhaul. If you have health issues that require you to pay attention to say the number of carbs or fat or sodium in your meals, still pay attention and take good care of your health and identify where/when you shift from awareness and self-care over to worry and obsession. The change might be more in how you interact with and apply the food rules. Shift your mindset to think about rules as guidelines for nurturing your body. As you shift into this way of thinking you will naturally have less stress about food. In the beginning, like any new habit, it might feel strange. Sometimes people feel like they will lose total control and overeat not knowing when to stop. This is why taking it slowly, step by step, will help you transition out of restrictive details and into a process where you’re in the driver’s seat. The guidelines for good nutrition are there to support your decision making from the inside out. Take in the info, thoughtfully consider how you can apply it to your lifestyle and nutritional needs, all the while taking into consideration any medical requirements. If you’re able to relieve yourself of the stress about the food rules you may have the capacity to eat more moderately and consciously. 2. You’re stuck in the diet mentality. The diet mentality is when you follow a diet plan that promises to solve your weight, body image or food problems in a distinct, often quick and nearly painless way, if you only follow a certain set of food rules. The promise of “just do this…” and you will be free lures you in. There are foods on the “OK to eat list” and others on a “don’t’ touch” list. You restrict yourself to a certain number of calories a day. You strictly follow a diet plan. These plans are so popular because it’s enticing to get a set of directions that clearly direct you to take certain action. Your belief or fear may be that your body will not cooperate with you. So, you find yourself trying to manipulate the food in some way. Most of the time, this type of relationship is based on the belief that you cannot trust your body to give you good information on what you need. But, you can develop a trusting relationship with yourself and make food decisions that meet your nutritional needs as well as your need for enjoyment and pleasure, so you feel satisfied with a meal. This situation calls for a mindset shift from viewing your body as separate from yourself, as if it’s a thing that you can easily shape and form at your will. The mindset that gets you out of the diet mentality is to develop a relationship with your body where you are treating it with kindness, compassion and respect. It’s difficult to overeat when you are treating yourself with kindness and respect. As you leave the diet mentality and eat in a way that respects your hunger and fullness, your awareness increases and your body naturally communicates with you by telling you it’s had enough and the kindness and respect give you the ability to peacefully stop eating. Get your free quick tips and all the latest news too! 3. Doing more than one thing while eating. Sometimes we will all eat while multitasking. We’ll go to the movies and eat popcorn or candy. We’ll have a big deadline and need to quickly munch at lunch while at the computer. It’s easy to get to the bottom of the bag before you realize you’ve eaten all of the popcorn. When you’re watching tv or at the computer or reading a book or driving your car, etc. paying attention to what you’re eating takes second place. It’s hard to know when you’ve had enough food to satisfy your physical hunger and the need for satisfaction, to feel like the meal is complete and you’ve had enough. The warning to stop only comes when you can’t ignore the uncomfortable fullness. Doing one thing at a time can actually save you time. If you typically turn on the tv or switch to your favorite app or email while eating it’s easy to get drawn into whatever you’re watching. The minutes pass by, just a bit more and before you know it, an extra 15, 30, 45, 60 minutes have passed. Doing one thing can also help you to eat more slowly, identify fullness and satiety sooner and possibly eat less. Doing one thing helps to prevent eating until you’re totally stuffed as your cue that you’re full. You may find that you enjoy your food more and want to eat the foods you feel good eating. 4. Viewing what you eat as a moral issue. When you put food in the category of good vs. bad and assign a moral value to it you’re going to get stuck. Foods have different nutritional values of course. I like to use the analogy of a serving of broccoli vs. a candy bar. Yes, they are very different from a nutritional perspective, but morally? You’re not a “bad” person if you eat candy nor are you a good person if you eat broccoli. Your body will have different responses and you may feel differently eating one vs. the other, but you have not gained or lost your, “I’m a good person” status. What do I want to eat (taste perspective)? What type of nutrition do I need given my activities in the next 4 hours (fuel perspective)? Which foods will meet my need for feeling good about what I’ve eaten (satiety)? When you ask yourself these questions you are helping your body and your mind as well as your self-esteem. You can make decisions based on the fullness of what’s important to you while taking care of your body both in what you need and in what you desire. 5. Not allowing yourself pleasure from the foods you eat. Follows from #4 above. Food is fuel and it’s also more than that too. It’s one of the pleasures in life that when acknowledged that it’s OK to enjoy you’re freed from overeating and all of the diet mentality related guilt about eating what you like. When you’re able to do this in a way that honors your need for both fuel and pleasure you’re no longer left wanting more and more and more. You can eat what you need, feel satisfied and eat with moderation. Normal eating is many things. Eating when you have the opportunity because you know what the next few hours will bring and you need to prepare. Eating is also sometimes for pure pleasure. The way to eat the foods you love without guilt and possible overeating is to make them part of your life. Let’s face it, you want to eat them, you probably do eat them. What would happen if you allowed yourself to experience food with pleasure? Would you feel less guilt and thereby less need to compensate for them? Would your daily nutrition meet all of your needs? Take some time this week to allow yourself the opportunity to practice moderation following the 5 suggestions above and let me know it goes! Conscious Eating gives you the tools you need to eat moderately, without guilt, nourishing your mind, body and heart with good food.